US President Donald Trump's first visit to Asia concluded on Tuesday (Nov 14). The 12-day visit was the longest tour by an American President this millennium. - The US leader played golf with Japan Prime Minister Shinzo Abe and Japan's world No. 4 Hideki Matsuyama on his first day in Japan. Mr Trump also met Japanese Internet sensation Pikotaro, known for his "pen-pineapple-apple-pen" tune that went viral in 2016. Mr Trump's stay in Seoul lasted only about 24 hours, the shortest in his five-nation tour. 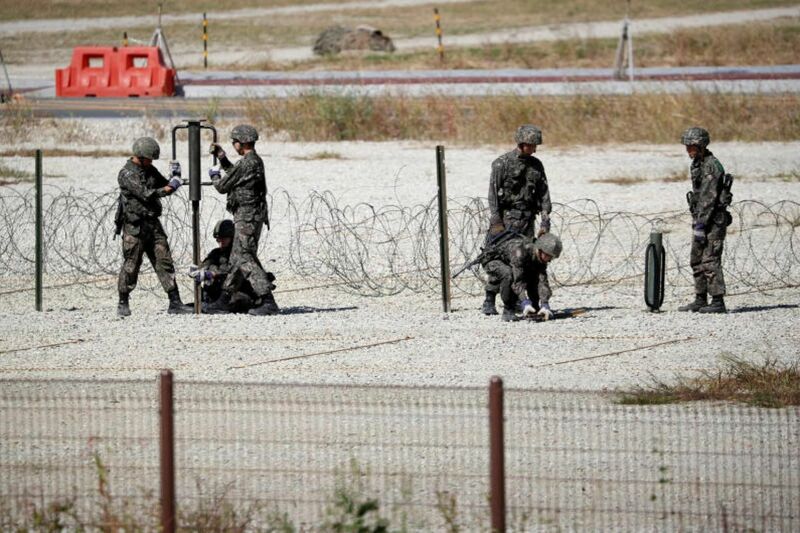 Due to adverse weather, the US leader had to skip a surprise trip to the Demilitarised Zone (DMZ), the tense border with North Korea, which has virtually become a staple in any official itinerary to South Korea. South Korea's serving of prawns from disputed waters at a state dinner for Mr Donald Trump had irritated Japan. 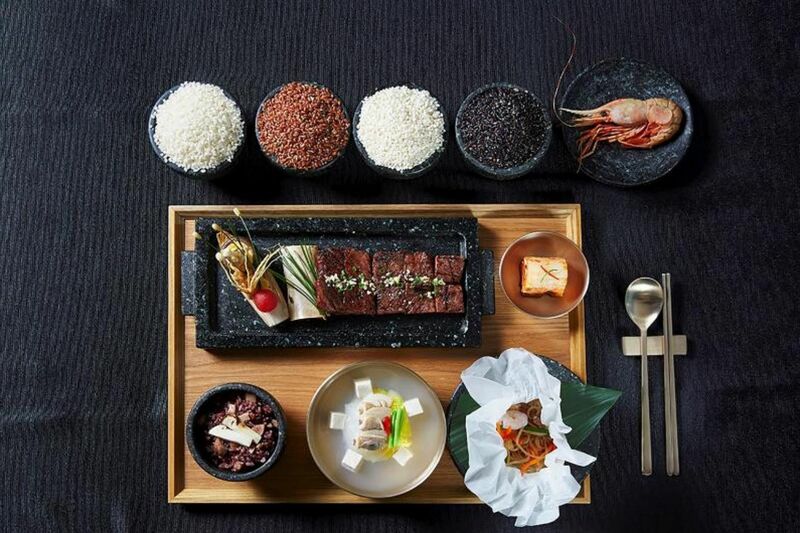 The prawns were fished near Seoul-controlled islets called Dokdo in the South and Takeshima in Japan, which have been at the centre of a diplomatic dispute between the South and its former colonial ruler for decades. The South's presidential office also invited to the state dinner, a woman who was forced into sexual slavery for Japanese troops during World War II. 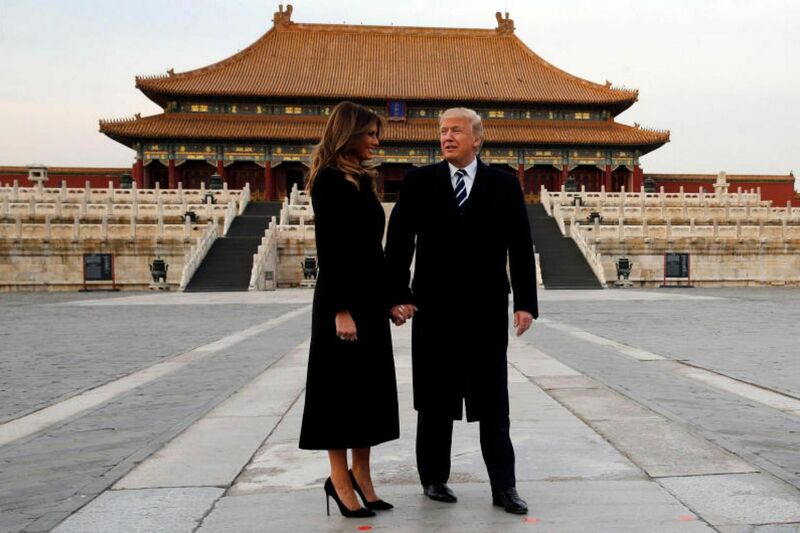 Mr Trump went over the "Great Firewall" of China in a late-night tweet in Beijing as he thanked his hosts for a rare tour of the Forbidden City and a private dinner at the sprawling, centuries-old palace complex. Many Western social media platforms such as Twitter and Facebook are banned in China. 5. 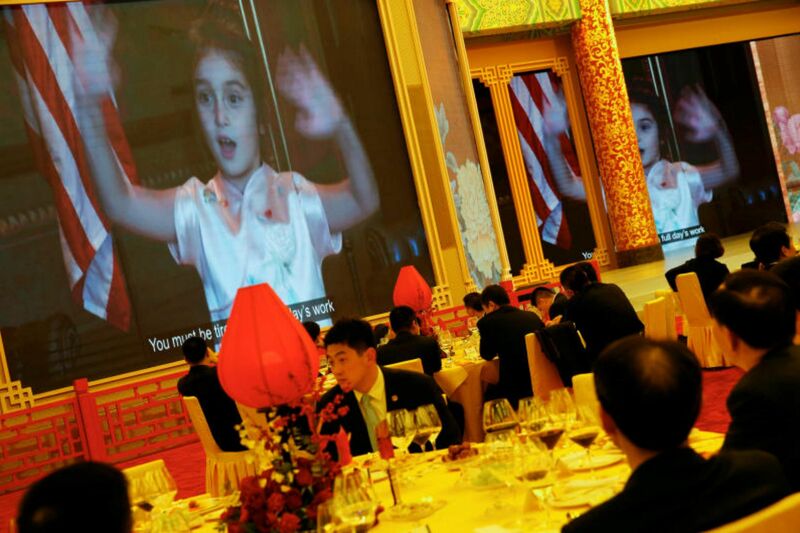 "Grandpa Xi, Grandma Peng"
In a video that Mr Trump showed Chinese President Xi Jinping during their stroll through the Forbidden City, Mr Trump's granddaughter, Arabella Kushner, greeted "Grandpa Xi and Grandma Peng (Liyuan)" with several Mandarin ballads and a recitation of ancient Chinese poetry. 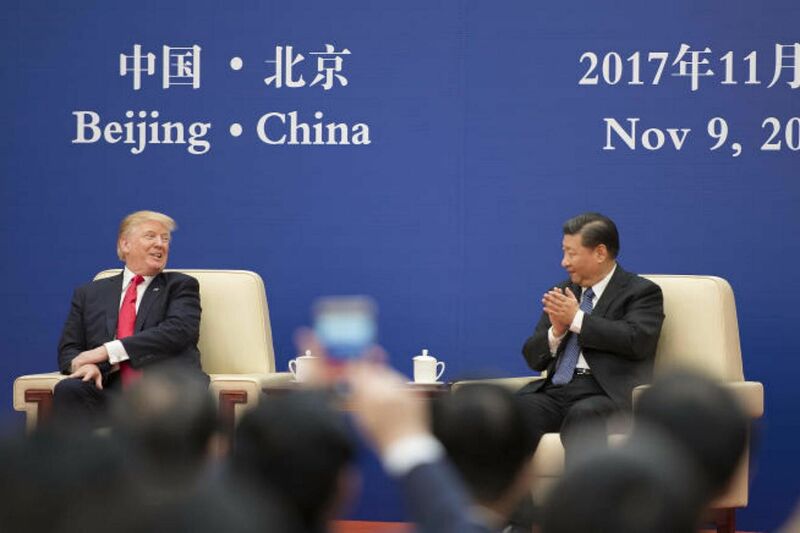 During the visit, Chinese and American firms inked a slew of energy, industrial and financial pacts worth more than US$250 billion (S$340 billion) in what could be one of the biggest economic agreements in recent years. However, critics said the 15 or so agreements are mostly non-binding memorandums of understanding and could take years to materialise - if they do at all. President Trump gave a spirited airing of his "America First" doctrine in a speech at the Asia-Pacific Economic Cooperation (Apec) summit in Danang, Vietnam, vowing his country will no longer tolerate unfair trade, closed markets and intellectual property theft, as he seeks to rewrite the rules of global commerce. Mr Trump offered to mediate in the troubled waters of the South China Sea. "If I can help mediate or arbitrate, please let me know... 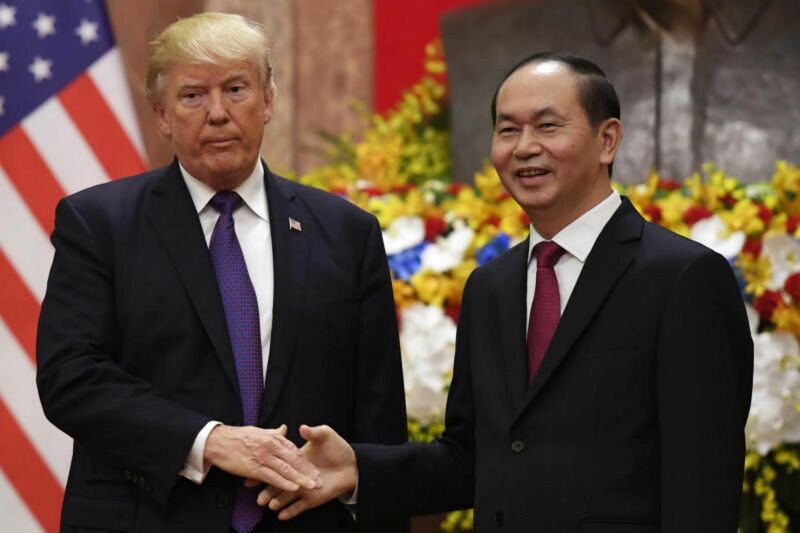 I am a very good mediator," Mr Trump told Vietnamese President Tran Dai Quang in Hanoi during an official state visit.China claims most of the South China Sea, with the Philippines, Vietnam, Malaysia, Brunei and Taiwan having claims that overlap with China's. 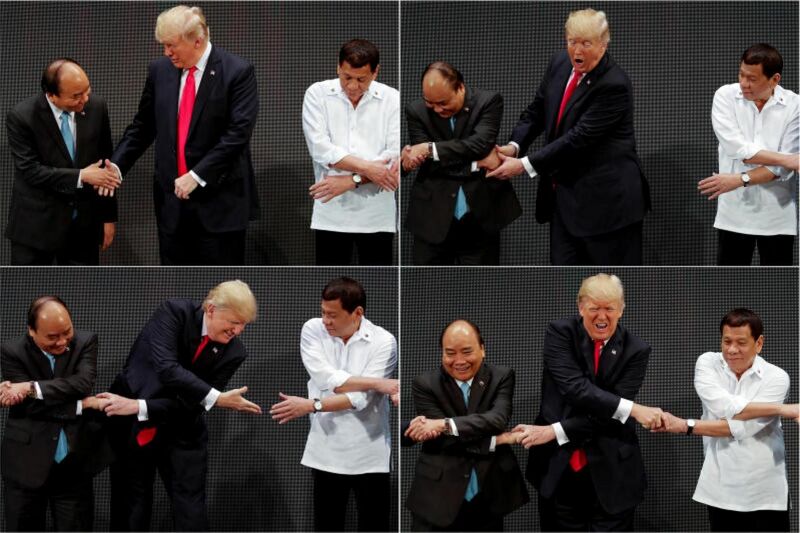 Mr Trump was all fingers and thumbs during a carefully choreographed photo shoot at a Asean summit. He failed to grasp whose hands he was supposed to be holding, breaking a line-up intended to showcase unity. 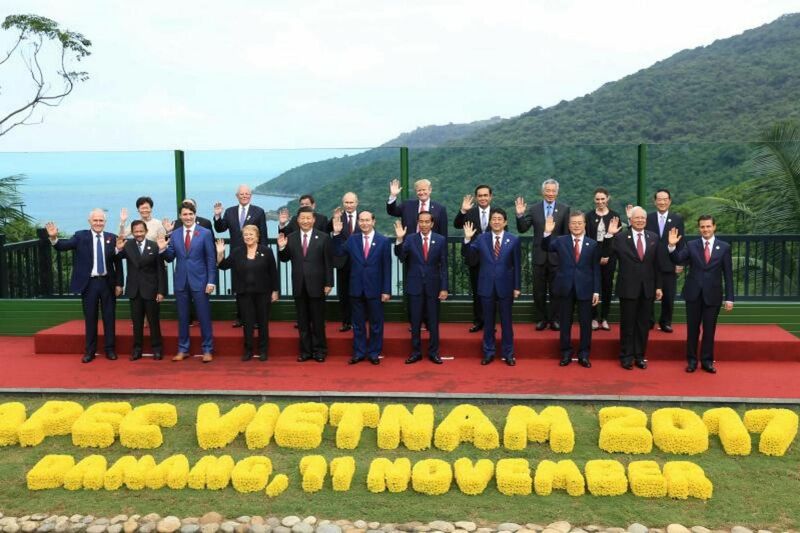 Mr Trump used both of his hands to clasp the extended fingers of Vietnam's Prime Minister Nguyen Xuan Phuc and did not hold on to the hand of summit host, Philippine President Rodrigo Duterte. Mr Trump appeared to recognise his error and eventually made the link between Mr Nguyen and Mr Duterte.